Storage auctions present golden opportunities to acquire valuable goods that have been abandoned by their previous owner. Although it might sound like a simple process, you need to do some preparation before going into the auction. Failure to do this could result in not getting what you want or paying too much for an item that you succeed in getting. 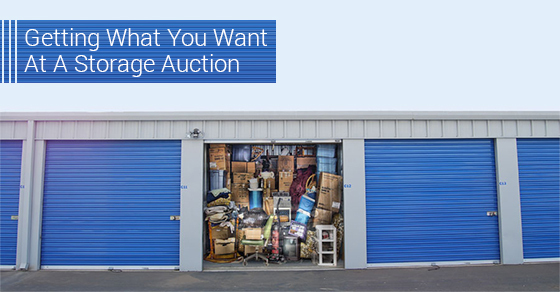 Here are a few suggestions to make sure you get the most out of a storage auction. There are many auctions you can choose from. The one you eventually pick should be the one that is most convenient for you to attend and benefit the most from. Be familiar with the rules of that auction. For example there might be age restrictions that do not allow you to bring children. It might also help to bring a friend along for support and occasional guidance in the bidding process. The most important thing you will need at an auction is cash. Most auctions don’t accept credit cards so make sure you have sufficient cash to be able to buy what you want. In addition to cash, you also need to have a flashlight, lock, pen and notepad handy. Some storage units do not have sufficient lighting and you need to secure your items once you successfully bid. It is also important to take notes when you are there. This way you can be able to get a sense of which places have the most value. Bidding is exciting and it is easy to get carried away by emotion. Don’t let that happen to you! Know what your budget is and stick to it. Even if you think an item is worth a certain amount, as a general rule you should always bid at a fraction of what you think it is worth (usually 20 or 50 cents on the dollar). Don’t get caught up in a bidding war, you will only end up losing in the end when you pay too much for an item. Sometimes an auction can be suddenly cancelled because the original owner of the unit made a last minute payment. In case this happens it is good to have another auction to attend. There are typically multiple auctions, so sign up for more than one auction in case one fails. Once the auction is over and you have one the unit, then you must make sure remove the items within the stipulated time period and do any cleaning that is required. Failure to do so could result loss of deposit money and being barred from future auctions. Storage auctions are exciting and can be lucrative, but not all storage companies offer them. Research ahead of time where these are available, and check out reviews online to see how well they’re run. This will give you an idea on which ones are worth the time before even going to your first! For more information, contact our team today.